A while ago I went through a stage of being obsessed with anything Ginger, I couldn't get enough of the stuff. Needless to say when I discover the Origins Ginger range I couldn't help myself and I asked for the perfume for Christmas the year before last. I did receive it from my husband as part of a gift set along with the matching whipped body cream. This cream is super soft and light to apply. The fragrance is gorgeous, just like genuine ginger and also a little tiny bit like cola bottles! 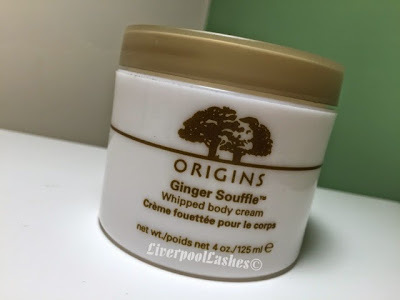 To be honest, I have this body cream for the scent as its a brilliant way to later the fragrance for true lasting power however it does actually do a fairly decent job at moisturising as well. I wouldn't say it was the most deeply moisturising treatment ever but it's definitely good enough for everyday use or for people that don't have particularly dry skin. As to whether I'd purchase it again, I wouldn't definitely get it for someone as a gift but for myself I really do adore my Laura Mercier Body Soufflés so I would probably stick with those.